Putting drops in children’s eyes « Howard J. Bennett - Pediatrician and Author in Washington, D.C.
Have your child lean back on a couch or comfortable chair. It helps if there are no bright lights in the room. Ask your child to look to the side rather than directly at you or the bottle. Gently pull down the lower eyelid and hold the bottle ½ to 1 inch above the eyelid. Squeeze the bottle so one drop falls onto the inner part of the lower eyelid nearest the nose. Ask your child to close his eyes for a few seconds so the drop coats the inner aspect of the eyelids. Infants and young children are usually uncooperative when it comes to having drops put in their eyes. With infants, parents can usually accomplish the task if one person opens both the upper and lower eyelids while the other instills the drops. Toddlers and preschoolers are impossible to coerce so the technique that works best with this group is to ask them to lie back with their eyes closed. You then place two drops on the closed eyelids nearest the nose. 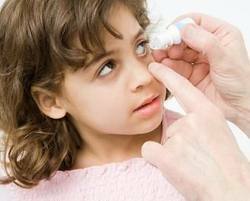 Once the drops are in place, ask your child to blink, which allows some of the medicine to enter the eye. If you’re not opposed to giving your child a treat, you can increase the odds of success by promising him something tasty if he cooperates. This entry was posted in Dr. B's Blog and tagged antibiotics, conjunctivitis, eye care, medication.